Condemn escalating repression by South Korean immigration under Lee Myung-Bak Administration! On 27 March 2012, South Korean immigration authority in Busan port, denied the entry of an member of AWC-Japan and her college student daughter into South Korea and deported them to Japan within the day. We, AWC-Japan, vehemently condemn the deportation by South Korean immigration under Lee Myong-bak administration. The deported member of AWC-Japan is an education worker and she have worked for building the solidarity relationship of teachers between Japan and Korea in order to promote the correct historical education based on serious reflection for past Japanese imperialist’s colonization of Korea. They have planned to visit South Korea for preparation of solidarity/integration event with the Korean Teachers and Education Worker’s Union that have been held regularly in recent years. They have also planned to visit the Independence Memorial Hall in Chungnam, South Korea for learning history. Lee Myong-bak administration, however, denied their entry to South Korea because they have joined AWC-Japan’s ‘peace tour to Jeju’ that was held on last August 2011 in order to show our solidarity for struggling people in Gangjeoung. An immigration staff in Busan port clearly said that ‘reason of banning entry is your last visit to Gangjeoung’. We strongly denounce the escalating repression against members of AWC-Japan by Lee Myong-bak administration, and the illegal construction of naval base in Jeju Island. The construction of new naval base in Gangjeoung, Jeju Island is a scheme along with the new military strategy of US imperialism that aim to reinforce the US military presence in Asia-Pacific region. Regardless of large opposition, Lee Myong-bak administration and South Korean navy started the blasting of Gureombi rocks that are scarcity natural heritage and spiritual home of local people on March 7, 2012. We strongly condemn the construction of naval base in Jeju that destroy environment and local community, and rise military tension in Northeast Asia extremely. Lee Myong-bak administration have intensified the repression against local people and supporters who resist the construction of the new naval base. It is also escalating the repression against foreign activists who show their solidarity with Gangjeoung people. Lee Myong-bak administration issued deportation orders against 2 foreign activists who join anti-naval base struggle in Gangjeoung and denied the entry of 3 members of ‘Veterans for Peace’ in the US into South Korea on March 14, 2012. At least 6 AWC-Japan related persons have been banned the entry to South Korea because of their experience of solidarity visit to Gangjeoung. Due to such repression by Lee Myong-bak administration, however, our determination for further commitment to anti-naval base struggle in Jeju have become more and more strong. We already held urgent protest against South Korean consulate in Osaka on March 9 and against South Korean embassy in Tokyo on March 13. We shall fight back against persistent repression against us by Lee Myong-bak administration and further promote campaign against construction of new naval base in Jeju in solidarity with people in Gangjeoung, Asia and the rest of the world. 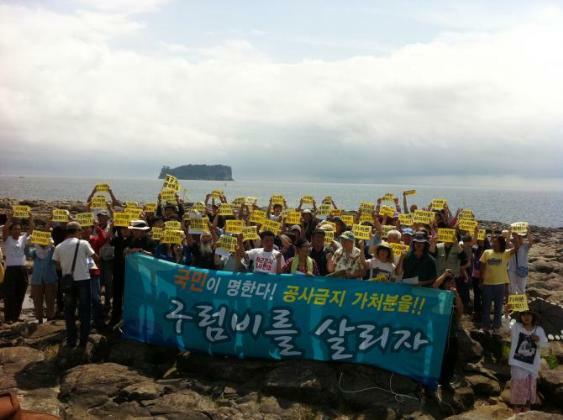 Stop construction of new naval base in Jeju Island! No to US-Japan-ROK military alliance! All the US troops, out of Asia! ← Long live people’s resistance to imperialism!